My answer: N-Acetyl Cysteine, (also known as NAC for short), because it has numerous benefits on multiple body systems! 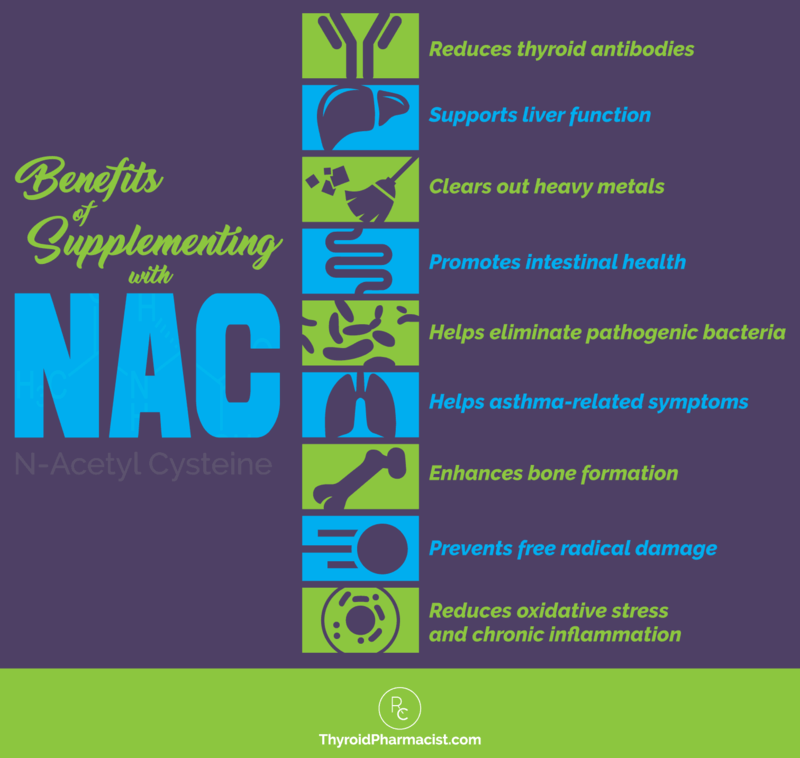 NAC helps to reduce thyroid antibodies, supports detoxification pathways (which are usually impaired in Hashimoto’s), and supports gut function. It can also help asthma, osteoporosis, oxidative stress, chronic inflammation, and other concerns often seen in those with Hashimoto’s. How does NAC support people with Hashimoto’s? How does NAC affect oxidative stress and chronic inflammation? How can I incorporate NAC into my life? N-acetyl cysteine (NAC) is a sulfur-based derivative of the amino acid L-cysteine. In the body, it acts as a potent antioxidant, and has been noted to be nearly 100 percent hepatoprotective—in other words, it has the ability to prevent liver damage. In the 1970s, NAC was found to be an antidote for Tylenol (acetaminophen) overdoses; and later, in the 1980s, it was discovered that NAC can help prevent toxic reactions to chemotherapeutic agents. Those with Hashimoto’s often have an impaired ability to clear toxins and may have an overload of toxins, including heavy metals. 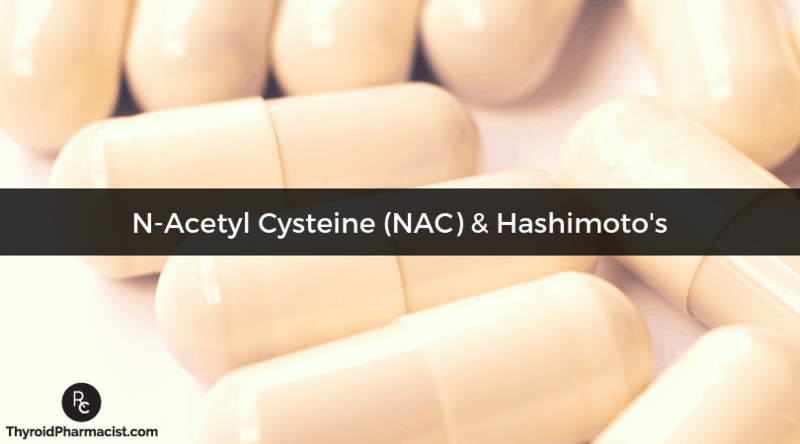 Because so many people with thyroid conditions are dealing with a toxic load on their bodies, I consider NAC to be a super supplement for people with Hashimoto’s. In the body, NAC turns into glutathione, an antioxidant which not only supports liver function, but also helps the liver to clear out heavy metals and other toxins. Additionally, experimental research and previous clinical studies have found that glutathione can help recover oxidative stress-induced liver damage in alcoholic and non-alcoholic liver diseases. In one study where 30 middle-aged participants with non-alcoholic fatty liver steatosis were randomly selected to receive either vitamin C or NAC, researchers found NAC could improve liver function in patients with non-alcoholic fatty liver disease (NAFLD). For this reason, NAC can be highly beneficial when considering starting your health journey with a liver support protocol. You can read more about the importance of liver support for Hashimoto’s in this article. While research shows other benefits, here I’ll focus on two fundamental conditions that supplementing with NAC can affect: oxidative stress and chronic inflammation. These two conditions are monumental drivers in almost every disease imaginable, including Hashimoto’s. One caveat – while I discuss them separately, many times they overlap. In other words, if you have chronic inflammation, you probably also have oxidative stress, and vice versa. When oxidative stress occurs, the process can adversely impact the DNA, proteins, and lipids (fats) within your cells. Researchers have found that free radicals can damage multiple cellular organelles and processes, disrupting normal physiology. While your body has several antioxidant defense mechanisms, too many free radicals can overwhelm your body and (among other things) impact gene expression, which could lead to inflammation. Oxidative stress can also become a key driver in Hashimoto’s and other thyroid disorders. In fact, researchers have found increased levels of oxidative stress among people with Hashimoto’s. When your thyroid gland makes thyroid hormones, it simultaneously creates free radicals. Without sufficient glutathione to keep that oxidative stress in check, excess amounts can impact other tissues. 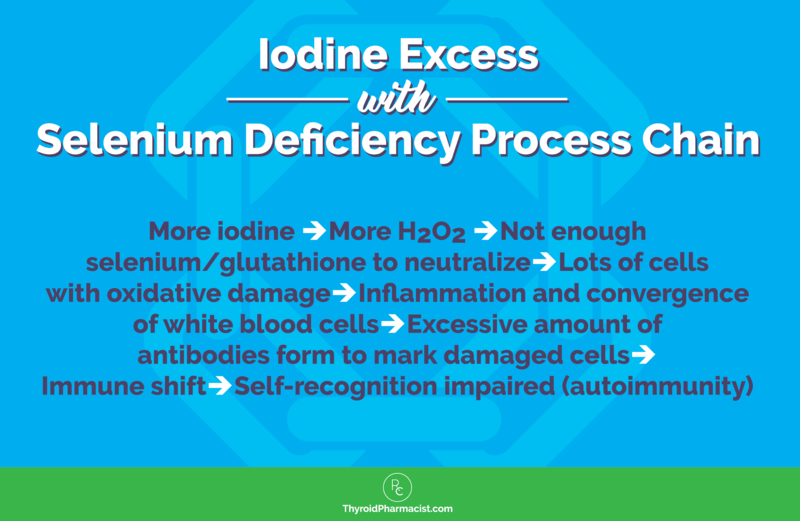 You can read more about this process in my article on iodine and Hashimoto’s. As such, maintaining a minimal oxidative load is a fundamental piece in protecting thyroid cell function. NAC helps to reduce this oxidative stress by neutralizing the hydrogen peroxide (which can otherwise cause damage to the thyroid gland). NAC is a precursor to the antioxidant glutathione. Glutathione is the most abundant antioxidant in your body, and is thus sometimes called the master antioxidant. It plays a role in many functions, including antioxidant defenses, nutrient metabolism, the regulation of cellular events including gene expression, cell proliferation, and immune response. A depletion in glutathione levels has been implicated with higher levels of thyroid antibodies and may contribute to Hashimoto’s. One study conducted in 2012 found that Hashimoto’s patients had 62 percent lower levels of serum glutathione compared to age-matched controls. In this same study, a significant relationship was identified between serum glutathione levels, TPO antibodies, and TSH. The lower the glutathione, the higher the antibodies, and the higher the levels of TSH, suggesting hypothyroidism. As a precursor of glutathione, NAC can help to optimize glutathione levels and reduce thyroid antibodies. NAC is an antioxidant in its own right. As a sulfur donator, it helps scavenge free radicals, and it does double duty, helping to boost glutathione levels by converting into glutathione in the body. If you’re healthy, your body can make a solid supply of glutathione. Unfortunately, many variables that overwhelm your body with oxidative stress and chronic inflammation – like stress, infections, and a poor diet – may result in your body making less than optimal amounts of this master antioxidant – which is not uncommon in those with Hashimoto’s. Inflammation gets a bad rep, but in the right situation, it can benefit you. For example, if we cut our finger, the immune system rallies up its defenses and comes to the rescue. Swelling, redness, and other immediate signs often follow. This type of inflammation, called acute inflammation, works as a protective defense for the body and then swiftly disappears when its job is done. On the other hand, chronic inflammation is inflammation gone wild: while this low-grade inflammation quietly simmers and festers, all kinds of trouble can result. The signs of chronic inflammation aren’t always obvious, but they can be harmful and even deadly. Studies connect chronic inflammation with many modern human diseases, including cardiovascular disease, Type 2 diabetes, and cancer. Chronic inflammation is a huge driver behind autoimmune diseases, like Hashimoto’s thyroiditis, as well. (As its name implies – anything ending with itis signals inflammation.) In fact, researchers have found that several genes encoding different inflammatory cytokines can influence the severity of Hashimoto’s. NAC can help dial down that inflammation. In one study, researchers found this supplement provided anti-inflammatory benefits while increasing the enzymes superoxide dismutase (SOD), glutathione, and glutathione S-transferase (GST). They concluded that NAC has both anti-inflammatory and (bonus!) anti-ulcerative effects. Chronic inflammation underlies many gut conditions, including intestinal permeability, or leaky gut, which is one of the three factors that must be present in order for autoimmune diseases like Hashimoto’s to occur. Leaky gut involves damage to the body’s intestinal lining and causes tight junction malfunctions, which allow substances like bacteria and food particles that are not intended to go through your gut wall, to pass through. Studies involving pigs have shown that NAC improves intestinal tissue damage, as is present with leaky gut, by creating signals that tighten the junctions (or “spaces”) within the intestinal wall. This in turn patches up the “leaks” in a leaky gut. When intestinal tissue damage is healed and leaky gut is reversed, many people may even be able to put their Hashimoto’s into remission! NAC can also promote intestinal health by helping to detoxify intestinal bacteria and breaking down biofilms. Biofilms are a collective of microorganisms that grow on biological surfaces and often house gut pathogens, which can, in turn, lead to infections. Today, many biofilms are becoming resistant to many clinical antibacterial treatments and host immune response, so researchers are looking for new substances to combat these resistant biofilms. A study in 2014 investigated NAC’s effectiveness in preventing the formation of biofilms, as well as in the destruction of existing ones. The study found that in combination with different antibiotics, NAC can significantly penetrate the deepest biofilm layers of bacteria that are becoming increasingly more resistant to classical antibacterial treatments. Respiratory Conditions – Those with autoimmune thyroid disease are more likely to develop or already have other autoimmune conditions, including asthma. If you have a stubborn hacking cough and excessive mucus buildup due to asthma, NAC could help. This acetylated form of cysteine is also a mucolytic agent, which means it can break down and thin mucus, as its sulfur content can cleave the bonds in mucoproteins. It may also benefit other respiratory-related conditions. One meta-analysis of 12 randomized controlled trials found that long-term (over six months) use of NAC reduced the risk of chronic obstructive pulmonary disease (which includes refractory asthma) becoming worse. Osteoporosis and bone health – Osteoporosis is more common in women with Hashimoto’s and thyroid conditions who take thyroid medications, as thyroid hormones speed up bone turnover. Researchers have found that inflammatory cytokines induce the expression of COX-2 (a chief driver of pain and inflammation among many chronic diseases) in the osteoblasts (cells responsible for the synthesis and mineralization of bones) of inflamed joints. This is followed by osteoclast activation, which breaks down bones. In one study, when NAC was added to rat bone marrow cultures, significant improvements were seen in the activity of alkaline phosphatase (levels of which increase when bones are growing) and osteoblastic cultures (cells that develop bone), as well as an upregulation of bone-related gene markers such as collagen. Another study found that NAC could inhibit the inflammatory process involved in bone resorption by regulating COX-2 expression. Type 2 diabetes – Inflammation (along with oxidative stress) plays a crucial role in the development of insulin resistance and Type 2 diabetes. One study published in the medical journal Free Radical Research in 2018 compared a group of mice who were fed a high-fat diet for 6 months with a group that was fed the same diet along with NAC. The group that was only fed a high-fat diet experienced a significant increase in body weight and body fat, a decrease in motor activity, and impaired glucose and insulin tolerance throughout the study. Meanwhile, the group that was fed NAC saw a significant increase in motor activity, improved glucose and insulin tolerance, as well as improvements to DNA and protein oxidative damage and adipose (fat-storing) tissue inflammation. The results suggested that NAC can improve insulin resistance and chronic inflammation in obese mice by providing anti-oxidative stress benefits. Obesity – Weight gain and metabolic disorders, including insulin resistance, often go hand-in-hand with thyroid conditions and inflammation. One 2016 study published in Pharmaceutical Research found that supplementing with NAC inhibited fat mass and obesity development in mice that were fed a high-fat diet. NAC also improved insulin resistance, suppressed fat from accumulating in the liver, and stimulated thermogenic (fat-burning) genes in the mice, suggesting that NAC may help protect against obesity and obesity-associated metabolic disorders. I recommend Rootcology’s Pure N-Acetyl Cysteine supplement. If you are following the Liver Support Protocol as outlined in my Hashimoto’s Protocol book , I recommend that you continue taking NAC for three to six months after supporting your liver. It is also safe to take on an ongoing basis. Daily doses of 1,800 mg are usually recommended. I generally recommend taking this supplement with food, to avoid stomach upset. As individual needs may vary, I highly recommend working with a healthcare practitioner to determine optimal dosages for your condition. While NAC is an FDA approved supplement and considered safe for most populations, it can interact with some medications. Using NAC with an active peptic ulcer is contraindicated, and this supplement can also interact with anticancer agents. Furthermore, it is not recommended while taking nitroglycerin or metoclopramide. If you have any concerns about possible medication interactions, please speak with your functional medicine practitioner. One last thing – if you open a bottle of NAC supplements and notice a bad odor, you likely did not get a bad batch. NAC’s sulfurous compounds can often cause a “rotten-egg” smell – but that is normal! If you are concerned, however, I recommend contacting the supplement manufacturer. If you have Hashimoto’s or any other autoimmune disease – or if you have chronic inflammation and oxidative stress – you may wish to consider taking this supplement. If you haven’t picked up a copy of my book Hashimoto’s Protocol already, I encourage you to do so and begin with the Liver Support Protocol. All of the supplements I recommend to support your liver can be found in the Rootcology store, including N-Acetyl Cysteine. I wish you well on your journey to health and healing! If you’ve used NAC, what did you use it for and did you notice any significant benefits? Have you ever used NAC or another precursor to boost glutathione levels? I’d love to hear your story below or on my Facebook page. P.S. Be sure to sign up for my email list and weekly newsletter to get a free book chapter, recipes, Thyroid Diet Starter Guide, information about Rootcology supplements, and notifications about upcoming events and my latest research. Beauchamp GA, Hart KW, Lindsell CJ, Lyons MS, Otten EJ, Smith CL, et al. Performance of a multi-disciplinary emergency department observation protocol for acetaminophen overdose. Journal of Medical Toxicology. 2013;3:235-41. doi: 10.1007/s13181-013-0310-2. Farrell SE, Defendi GL, Miller MA, Burns MJ, Corden TE, Fernandez MC, et al. Acetaminophen Toxicity Treatment & Management. Medscape. https://emedicine.medscape.com/article/820200-treatment. Updated January 22, 2018. Accessed May 8, 2018. Nimni ME, Han B, Cordoba F. Are we getting enough sulfur in our diet?. Nutrition & Metabolism (London). 2007;4:24. Mokhtari V, Afsharian P, Shahhoseini M, Kalantar SM, Moini, A. A Review on Various Uses of N-Acetyl Cysteine. Cell Journalism. 2017;19(1):11–17. Fowdar K, Chen H, He Z, Zhang J, Zhong X, Zhang J, et al. The effect of N-acetylcysteine on exacerbations of chronic obstructive pulmonary disease: A meta-analysis and systematic review. Heart & Lung: The Journal of Medical Care. 2017;46(2):120-128. doi: 10.1016/j.hrtlng.2016.12.004. Chaumais MC, Ranchoux B, Montani D, Dorfmüller P, Tu L, Lecerf F, et al. N-acetylcysteine improves established monocrotaline-induced pulmonary hypertension in rats. Respiratory Research. 2014;15:65. doi: 10.1186/1465-9921-15-65. Sacco R, Eggenhoffner R, Giacomelli L. Glutathione in the treatment of liver diseases: insights from clinical practice. Minerva Gastroenterologica e Dietologica. 2016;62(4):316-324. Khoshbaten M, Aliasgarzadeh A, Masnadi K, Tarzamani MK, Farhang S, Babaei H, et al. N-acetylcysteine improves liver function in patients with non-alcoholic Fatty liver disease. Hepatitis Monthly. 2010;10(1):12-6. McLeay Y, Stannards, Houltham S, Starck C. Dietary thiols in exercise: oxidative stress defence, exercise performance, and adaptation. Journal of the International Society of Sports Nutrition. 2017;14:12. Thannickal VJ, Fanburg BL. Reactive oxygen species in cell signaling. American Journal of Physiology. 2000 Dec;279(6):L1005-28. Auten RL, Davis JM. Oxygen toxicity and reactive oxygen species: the devil is in the details. Pediatric Research. 2009;66(2):121-7. doi:10.1203/PDR.0b013e3181a9eafb. Bouayed J, Rammal H, Soulimani R. Oxidative stress and anxiety: Relationship and cellular pathways. Oxidative Medicine and Cellular Longevity. 2009;2(2):63-67. Wu G, Fang YZ, Yang S, Lupton JR, Turner ND. Glutathione metabolism and its implications for health. The Journal of Nutrition. 2004;134(3):489-92. Dringen R. Metabolism and functions of glutathione in brain. Progress in Neurobiology. 2000;62(6):649-71. Ruggeri RM, Vicchio TM, Cristani M, Certo R, Caccamo D, Alibrandi A, et al. Oxidative Stress and Advanced Glycation End Products in Hashimoto’s Thyroiditis. Thyroid. 2016 Apr;26(4):504-11. doi: 10.1089/thy.2015.0592. Steele ML, Fuller S, Maczurek AE, Kersaitis C, Ooi L, Münch G. Chronic inflammation alters production and release of glutathione and related thiols in human U373 astroglial cells. Cellular and Molecular Neurobiology. 2013;33(1):19-30. doi: 10.1007/s10571-012-9867-6. Atalay F, Odabasoglu F, Halici M, Cadirci E, Aydin O, Halici Z, et al. N-Acetyl Cysteine Has Both Gastro-Protective and Anti-Inflammatory Effects in Experimental Rat Models: Its Gastro-Protective Effect Is Related to Its In Vivo and In Vitro Antioxidant Properties. Journal of Cellular Biochemistry. 2016;117(2):308-19. doi: 10.1002/jcb.25193. Uraz S, Tahan G, Aytekin H, Tahan V. N-acetylcysteine expresses powerful anti-inflammatory and antioxidant activities resulting in complete improvement of acetic acid-induced colitis in rats. Scandinavian Journal of Clinical and Laboratory Investigation. 2013 Feb;73(1):61-6. doi:10.3109/00365513.2012.734859. Yamada M, Tsukimura N, Ikeda T, Sugita Y, Att W, Kojima N, et al. N-acetyl cysteine as an osteogenesis-enhancing molecule for bone regeneration. Biomaterials. 2013;34(26):6147-56. doi: 10.1016/j.biomaterials.2013.04.064. Origuchi T, Migita K, Nakashima T, Honda S, Yamasaki S, Hida A, et al. Regulation of cyclooxygenase-2 expression in human osteoblastic cells by N-acetylcysteine. Journal of Laboratory and Clinical Medicine. 2000;136(5):390-4. Hou Y, Wang L, Yi D, Wu G. N-acetylcysteine and intestinal health: a focus on its mechanism of action. Frontiers in Bioscience (Landmark Ed). 2015 Jan 1;20:872-91. Mancini A, Di Segni C, Raimondo S, Olivieri G, Silvestrini A, Meucci E, et al. Thyroid Hormones, Oxidative Stress, and Inflammation. Mediators of Inflammation. 2016;2016:6757154. doi: 10.1155/2016/6757154. Zaletel K, Gaberšček S. Hashimoto’s Thyroiditis: From Genes to the Disease. Current Genomics. 2011;12(8):576-88. doi: 10.2174/138920211798120763. Rousset B, Dupuy C, Miot F, Dumont J. Chapter 2 Thyroid Hormone Synthesis And Secretion. Endotext. South Dartmouth, MA: MDText.com, Inc; 2015. https://www.ncbi.nlm.nih.gov/books/NBK285550/. Accessed May 8, 2018. Dinicola S, De Grazia S, Carlomagno G, Pintucci JP.N-acetylcysteine as powerful molecule to destroy bacterial biofilms. A systematic review. Eur Rev Med Pharmacol Sci. 2014 Oct;18(19):2942-8. Ma Y, Gao M, Liu D. N-acetylcysteine Protects Mice from High Fat Diet-induced Metabolic Disorders. Pharm Res. 2016;33(8):2033-2042. doi:10.1007/s11095-016-1941-1. Which Wine Pairs Best with Your Thyroid Symptoms? Is NAC safe if GAD 65 antibodies are present. I do not have diabetes, but my functional doctor wanted to test for GAD 65 antibodies. I’m understanding that GAD 65 has something to do with conversion of glutamate to GABA. Dear Izabelle, I rely on your book and blog posts so much. I’m in the care of a naturopathic doctor, mainly so I could get prescribed natural desiccated thyroid and LDN. How does the NAC react with LDN, and is it better for reducing thyroid antibodies? Or not? Jacki – thank you for reaching out. I am happy to hear you have found a practitioner. <3 I don't have any information to share with you at this time, but will add this to my research list. I recommend you discuss this with your clinician. Is it possible to have a worsening of symtoms initially, like a dye off effect? Alba – thank you for reaching out. I am so sorry you are not feeling well. <3 Even at high doses, researchers have found NAC to be safe and well tolerated. However, it’s important to note that NAC can cause stomach upset, nausea, vomiting and diarrhea if taken on an empty stomach, so it should be taken with food. Moreover, NAC is not recommended if you have an expressed CBS mutation or a sulfur sensitivity. I recommend that you reach out to your practitioner who is familiar with your health history. I appreciate all the good information presented here on NAC. Since it is a precursor to glutathione, would IV glutathione be even better? I have had it a couple of times with IV vitamin C, but may consider a more regular dosing if so. Penney – thank you for reaching out and sharing your journey. <3 I am not able to advise on whether this supplement would be appropriate for you and your specific health needs without a comprehensive health assessment. Please discuss the use of supplements with your personal doctor. Since NAC is a precursor to Glutathione, why not just take that? Hi! Can I take NAC during pregnancy? And can you make an article of which supplements did you use during pregnancy and postpartum? Thank you very much for this very informative material on NAC. I’ve been taking it for some time and appreciate the details of your report together with the fact I should take it with food. It was said that I had osteopenia (sp), (yeah, I’ve been on thyroid meds about 60 years) but now I’m not even in the alert stage for bone density!!! I have been told I have liver toxins buildup (whatever the proper name for it is), but now with both NAC and milk thistle, the toxins are gone. Thanks to all your past info as well as all the docs on chronic disease documentaries, I have felt much more well than for a long time, though because we can’t get proper testing here, we have to work at it mostly alone. Thanks again, Dr. Wentz; I have your first book and still check back into its help. Can I take NAV if I’m allergic to Sulfa medications? For those of us who have a sulphur intolerance, would we be able to take this product. Even wine, unless it us organic, the sulphur in it makes me cough. I am allergic to both Sulpha based drugs and coconut. Any suggestions on how to work on my leaky gut other than monitoring my diet? Thanks! Tina – thank you for reaching out and sharing! <3 We know that intestinal permeability (aka leaky gut) is present in every case of autoimmunity and often precedes the development of Hashimoto’s. Symptoms of leaky gut may include bloating, diarrhea, constipation, stomach aches, acid reflux and irritable bowel syndrome. According to the Institute of Functional Medicine, many people develop IBS 5-10 years before an autoimmune diagnosis. I was one of them and didn’t take my gut health as seriously as I should have. Gut problems are often caused by infections like H. pylori, parasites like Blasto, SIBO, an imbalance of bacteria, and enzyme deficiencies or food sensitivities (especially to gluten, dairy, and/or soy). Even stress can be a factor in gut permeability. Here are some articles you might find interesting. Thank you for providing this information concerning the supplement NAC. My functional medicine dr perscribed high dose for me as I had been dealing with constant dry, non productive cough for quite awhile and then recurring acute bronchitis and acute sinusitis earlier this year. I took a two week dose of antibiotics but a couple days later the symptoms came back full force so my functional medicine dr perscribed a month long course of antibiotics and probiotics, along with me taking two 900mg in the morning and two 900mg in evening while taking the antibiotics. To support my liver function during the couse of antibiotics as I have had non alcoholic fatty liver for many years. My concern is that I did not realize I was supposed to stop taking all that NAC once my course of antibiotics ended. Also I am sensitive to sulfer. I was experiencing very dry sinus and inside of my nose was very painful. Anyway I fortunately contacted the dr and she told me to just take one NAC per day. I stopped taking it completely till I see her in January. My sinus symptoms have cleared and nose feels normal again but what a painful experience that was! After reading your info concerning the benefits of NAC I will try taking just one per day and see how I feel. Seems I may have over done a good thing! Deanna – thank you so much for sharing your journey! <3 I hope you will keep me posted on your progress. Such an informative article. Thank you. Would this detoxification pathway help the liver clear unwanted estrogens from the body? It seems we’re all affected to some extent by unwanted estrogens in the environment, etc. Vivien – you are very welcome! Toxins and chemicals are established environmental triggers for developing Hashimoto’s in people who are genetically predisposed. These include iodine intake, bacterial and viral infections, hormonal imbalances, toxins, as well as therapy with certain types of medications and mercury! First of all I want to thank you for all of the incredible work you have done to support all the women out there with Hashimoto’s. I have read both of your books, and have received so much benefit from changing my diet and adding in the supplements. I am still struggling with some of my root causes, and healing my gut, but know that healing is a continuous process, and am trying to be more loving to myself throughout (another big benefit I got from your book- addressing the emotional healing side of living with autoimmunity!) I wanted to ask you- were you able to eventually get your Hashis in remission and get off of the thyroid hormone drugs? I have had Hashis, and have been taking thyroid hormone (first Synthroid and then NDT) for 10 years now. I am seeing a functional medicine doctor who has been great overall, but says the chances of me ever getting my thyroid function back/getting off of the drugs are very slim considering it’s been so long… Have you seen any of your patients go into remission after such a long period on hormone replacement? Thank you so much. With love and thanks! I would love to hear more about the protocols on tissue regeneration. I remember reading about the laser therapy in your last book. Have you heard of development of stem cell injections? Very open to try anything at this point! Oh, and I had one more question- my Free T3 is quite high/out of range. Do you have any info on what this might mean? my endocrinologist thinks it’s just from taking NDT but my functional medicine doctor thinks it could be pointing to the meds not functioning properly/ possible adrenal issues. Curious if you have come across High Free T3 with Hashi in your practice and have any thoughts! Thanks so much! Hello,Izabella. I was diagnosed with hashimoto’s 10 years before. No doctor said me “it can be heal”. Do I have a chance to get my health back after so many years? I have been taking curcumin since 2014 to help in my fight of thyroid cancer. Is NAC better than curcumin for this purpose? If so, in what ways? David – thank you for reaching out and sharing. <3 I am not able to advise on whether this supplement would be appropriate for you and your specific health needs without a comprehensive health assessment. I recommend that you discuss this with your personal doctor. Hi Dr. Izabella, I like many others thank you for your work. I’ve been taking NAC for close to 5 months along with a protocol involving PectaSol-C, provided by my practitioner, to help bind toxins to promote their elimination from my body. I believe this is helping. My question concerns the testing of my microbiome, perhaps through a company called Viome, which claims to be able to test my particular microbiome for the types of food my body needs at this time in addition to recommending foods my body does not need at this time. Could you share your thoughts on testing the microbiome? Dianne – thank you for reaching out. I am not familiar with that test. The gold standard, most accurate test for food sensitivities is going to be an elimination diet, but if you are someone that is not quite ready to do one, or needs to see things in black and white, you may want to look into food sensitivity testing. I recommend the 184 Food Allergy IgG test from Alletess or their 96 Food version. Here are some resources you may find helpful. I was on NAC 3 x a week for a week. I found that I was on top of the world day of. Then the next day I was a bit tired and somewhat depressed and then the next day I was exhausted and not getting over my depression or mood swing. Took NAC and again on top of the world. My doctor said she never heard of this and end of discussion. I stopped until I get further info. Also is it true if you have silver fillings you shouldn’t use this? I hope you can answer this. Lisa – thank you for reaching out and sharing! <3 I wish I could give you more direct advice but, each person will react differently. I would advise you to ask your trusted clinician who’s care you are under. Hi, I can’t get Rootcology in the UK. I can get a hypoallergenic product suitable for me but it’s only 500mg per capsule. If the required dose is 1800mg per day as you’ve said then I can only take either 1500mg or 2000mg. Will this matter? I wouldn’t want to take too much, nor would I want to take too little and not have enough effect. Also, you mention a rotten egg smell which I know is well known for sulphur. My concern is, would I end up smelling like rotten eggs if I take it?! Like can sometimes happen with garlic capsules etc. I started 900mg NAC, within 2 days my sleep is worse, trouble falling asleep and staying asleep. I didn’t make any other changes. I’m taking it at 10am. Would there be any point in trying a lower dose? Or any other suggestions for me? Can I take this supplement while also using an ashwaghanda/probiotic supplement? Molly – thank you for reaching out. NAC is an FDA approved supplement and considered safe for most populations, it can interact with some medications. Using NAC with an active peptic ulcer is contraindicated, and this supplement can also interact with anticancer agents. Furthermore, it is not recommended while taking nitroglycerin or metoclopramide. If you have any concerns about possible medication or supplement interactions, please speak with your practitioner. I added 3 additional supplements: NAC, Alpha Lipoid Acid, and S-Acetyl L-Glutathione. I read about increased bioavailability of the S-Acetyl L Glu. Crossing fingers. Grateful for your info on gut biome. After reading your info, I added the Pure Encapsulations brand of Enzymes, the Pure Encapsulations probiotic, & Pepsin HCL. Multi Vitamin- Today I am switching to an iodine free formula of the Pure Encapsulations Nutrient 950. Fortunately, my physician will test my antibody level, as often as I want. He warned me, that the insurance company may not pay for it. So that might be a reason why some physicians ‘hold back’ on testing frequently. Glad you provided us a link to self-refer to get our own testing done. Sign-up and receive the Digestion and Depletions book chapter, a Thyroid Diet Quick Start Guide and 10 nutrient dense thyroid friendly recipes! Can Vegan Diets Help Hashimoto’s? Which Protein Is Safe for Hashimoto’s? Disclosure: We are a professional review site that receives compensation from the companies whose products we review. We test each product thoroughly and give high marks to only the very best. We are independently owned and the opinions expressed here are our own. *These statements have not been evaluated by the Food & Drug Administration. These products are not intended to diagnose, treat, cure or prevent any disease. The information contained herein is for informational purposes. Please be sure to consult your physician before taking this or any other product. Consult your physician for any health problems or before starting a new program.